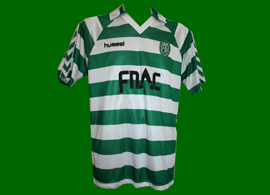 The home hooped jerseys as such remained the same as the previous year, again made by Hummel. 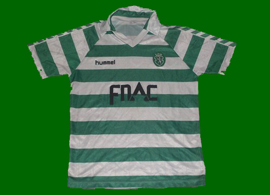 The sponsor FNAC is also the same, but no longer on a rectangle, the letters are directly on the shirt. 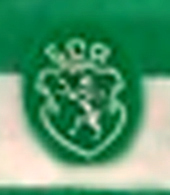 The player numbers are tyically different from the season before, but not in every case. 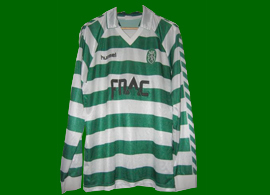 Stromp jerseys of the previous season were worn in at least one friendly training game. 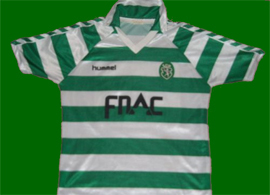 We do not know as yet photos of Stromp jerseys in official games, with the official sponsor FNAC in the correct lettering type. 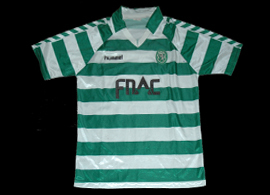 White away jerseys with green details, similar to those of the following season, were introduced, with the same sponsor style as the home tops.